Thank you for your interest in #ShareYourStripesAL – Please note that this challenge has ended. To see who WON the Challenge, check out our blog. Join us for the #ShareYourStripesAL Challenge! 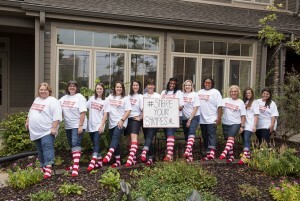 In honor of Day of Change, RMHCA is holding a social media challenge — we want to see your stripes! Grab your friends, family, co workers, kids, pets, whoever you can find and take a picture of you in your RED AND WHITE STRIPES! Take a picture and post it to Facebook, Twitter or Instagram with the hashtag #ShareYourStripesAL. RMHCA will select the most creative picture as the official 2015 #ShareYourStripesAL Challenge Winner and the winner will be announced on Friday October 9th! The winning image will be displayed on a digital billboards in Birmingham leading up to Day of Change (which is on October 15th). If you take a look at the RMHC logo – does anything jump out at you? What about the Ronald McDonald’s red and white stripes?? They are simple and fun and have become a universal symbol for the entire Ronald McDonald House Charities organization. Day of Change is just one of the times that we focus on red and white stripes! We hope that anytime you see the colors together in a stripe pattern you think of RMHCA. What is Day of Change? It is the day when the entire RMHC global organization commemorates the opening of the very first Ronald McDonald House in Philadelphia. To celebrate, we rally around Donation Boxes for our Day of Change, each year, to ensure that we continue to keep families close when their child needs to heal. What does that mean for you? You know those pennies, dimes, nickels and quarters in couch cushions and under the seats in the car? Put them to good use. 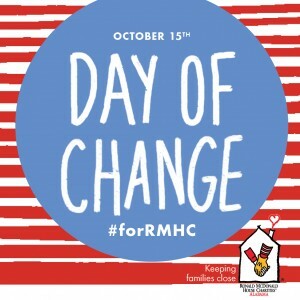 Celebrate the RMHC #DayofChange #forRMHC families at participating McDonald’s. Your spare change can make a big difference. When will this contest take place? The contest will run Wednesday September 30th through October 7th, 2015. All images must be uploaded and tagged by October 7th at midnight to be considered a part of the Challenge. Where do I share the image? The #ShareYourStripesAL Challenge will take place on Facebook, Twitter and Instagram only. All pictures must be posted and tagged by midnight on October 7th. Only posts on public accounts can be considered. What if I do not want my picture on a billboard? By willingly tagging your picture with the hashtag #ShareYourStripesAL, you are giving permission for your image to be shared publicly. I am not on social media, can I enter? We would still love to see you in your red and white stripes, but unfortunately to be considered, you must share the photo on Facebook, Twitter or Instagram. I am on Facebook, but like my account to be private. What can I do? If you wish, you can share your image to our Facebook page wall or RMHCA’s Day of Change event wall. Yes, every picture posted with the hashtag #ShareYourStripesAL will be considered — get creative!